William Stetz has generated film production and photography works from the earliest days of his career. He has filled the roles of art director, production designer, sound crew, camera and lighting crew, still photographer, producer and director. His early work in the television industry and for many years includes series for Lifetime Medical Television, the Cable Health Network and others. (IMDb profile.) Most recently, he produced and directed the bio-documentary “A Handmade Life,” an official selection of the 2011 Ventura Film Festival. William’s photographic portrait work includes the subjects Clint Eastwood, François Bonnot, John Frankenheimer, Carol Littleton, Steven Spielberg and Nicolas Roeg among others. 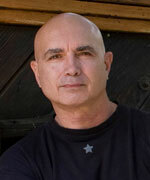 As a filmmaker, Mr. Stetz has produced and/or directed commercials, shorts, animation, title sequences and graphic sequences. His film work is referenced on his production website, American Prairie Artists. He has a close affinity to “home” and our homeland, was raised in Illinois and now lives in Burbank, CA.